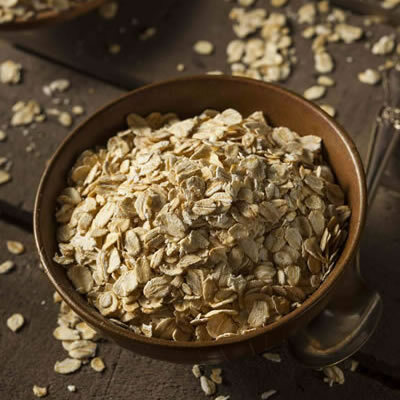 Oats are high in fiber. The daily recommendation for fiber intake is 25 grams. Therefore, if an individual serving of a food product provides 5 grams or 20% of fiber for the consumer, then the product is considered high in fiber, and consequently, highly nutritious. On the other hand, if a food label denotes a product is “a good source of fiber,” the product must contain 10-19.6% of the daily value of fiber per individual serving. The 25-gram requirement of fiber intake is framed for those who consume roughly 1,800 calories per day. For individuals who consume a caloric intake of more or less than 1,800, a frame of reference posed by the United States Department of Agriculture is that for every 1,000 calories consumed, 14 grams of fiber should be consumed. In the baking industry, whole-wheat or products containing oats are considered high in fiber. For instance, whole-wheat spaghetti contains over 6 grams of fiber and oatmeal contains 4 grams. “21CFR101.54.” CFR – Code of Federal Regulations Title 21. Aune, D., D. S. M. Chan, R. Lau, R. Vieira, D. C. Greenwood, E. Kampman, and T. Norat. “Dietary Fibre, Whole Grains, and Risk of Colorectal Cancer: Systematic Review and Dose-response Meta-analysis of Prospective Studies.” Bmj 343. Nov10 1 (2011): D6617. Ktenioudaki, Anastasia, and Eimear Gallagher. “Recent Advances in the Development of High-fibre Baked Products.” Trends in Food Science & Technology 28.1 (2012): 4-14. Haros, Mónica, Cristina M. Rosell, and Carmen Benedito. “Use of Fungal Phytase to Improve Breadmaking Performance of Whole Wheat Bread.”J. Agric. Food Chem. Journal of Agricultural and Food Chemistry 49.11 (2001): 5450-454.